Beautiful property with everything you could need and spotlessly clean. Superb views of the sea and mountains. Very relaxing. Casita Amanacer is situated in a sheltered valley between Arrieta and Haria; the climate is perfect. Your Casita is totally self contained private and not overlooked. We spent a relaxing week at this charming casita tucked away on the hillside of Tabeyesco with views of the coast in the distance. Great spot to recharge your batteries or begin work on that novel! 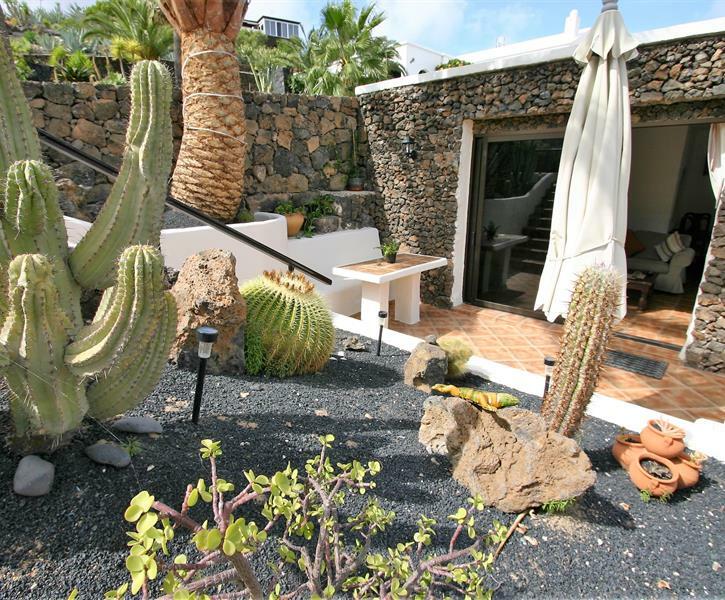 Casita has everything you need plus good wifi, a wealth of TV stations, films and books. Amanda and Jan live nearby and provide unobtrusive help as required including a good welcome pack. Boon if you are arriving late in the evening. 5 minute drive downhill to the petrol station/supermarket and another couple of minutes to Arrieta's own village supermarket and La Garita beach. Not much in the way of night life or manufactured entertainment here but you don't go to the north of the island for that. Handy for Jameos del Agua, Mirador and ferries to Graciosa. Try the jazz/pop instrumental concerts in the atmospheric Jameos every Tuesday and Sunday evening plus other events. If you are an independent traveller who likes to go a little off the beaten track you should love Casita Amanacer. If you want peace, quiet and solitude then this is the place for you. Lovely views from your private terraces and at times you can hear a pin drop. Jan and Jayne made us feel welcome and then left us alone to do our stuff in the knowledge that they were there if we needed help with anything. You do need a car unless you intend to stay very local and then you need the stamina of an Olympic athlete if you want to eat out every day. We walked in to Arrieta one evening for a meal and walked back. We consider ourselves fairly fit but the walk back - uphill! - was a challenge to say the least, especially after a particularly good bottle of El Grifo wine. Arrieta and Punta Mujeres are a few minutes away by car and between the two places there are enough restaurants/bars to eat out regularly. The 'Amanacer' restaurant in Arrieta has gambas to die for! Check closing days/times of restaurants as they all differ and some close quite early. Alternatively the supermarket in Arrieta has adequate stock to self cater if you wish. Fresh meat is not available locally if this is what you want for a bbq but there is a butcher in Guatiza, a short drive up the coast. However we specifically chose Arrieta for it's reputation as a fishing village with good fresh fish. This was our first trip to Lanzarote and our first trip to a Spanish island in many years and we thoroughly enjoyed ourselves. This is our second visit so that tells you something. A very comfortable cassita with everything you need, it's home from home but with sunshine and views. The owners, Jan, Amanda and Jane make you very welcome and on hand if you need anything. We will be back again next year but for a longer visit hopefully. Thanks to Jan for making our stay that little bit more special.